Pictures posted by Facebook user Debbie Rose West show a blanket of snow-like hail following the storms. 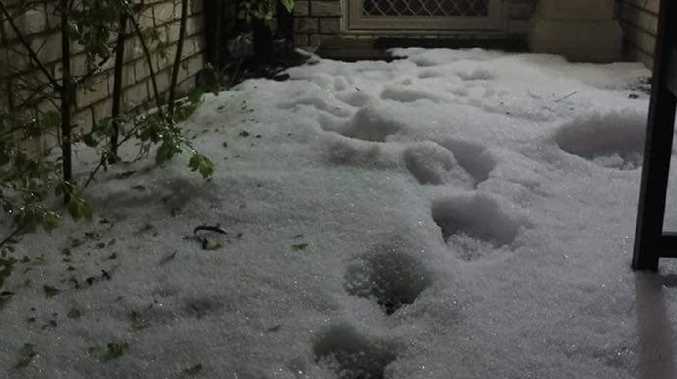 PARTS of southeast Queensland were left blanketed with "snow" after spring storms dumped hail in vast quantities overnight, and the Weather Bureau says there is more to come today. A number of supercell storms swept through the Brisbane and Gold Coast regions, with particularly intense cells hitting the far south of the state. Central and northern Gold Coast residents were woken to cracking thunder as an intense thunderstorm ripped across the city at 11.30pm last night. 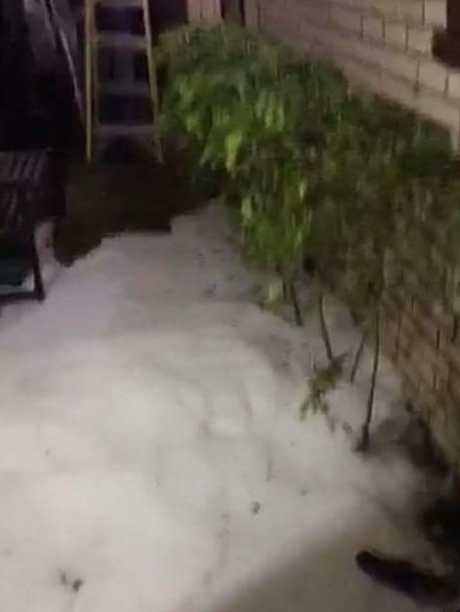 It dumped up to 48mm of rain and blanketed streets and gardens with a heavy layer of hail. Some residents reported damage to their homes as wind gusts whipped up to 50km/h. Pacific Pines resident Debbie Rose West posted a photo of a large hole in her ceiling and another local - Cheryl Boyd - reported the roof of her chicken coop had caved in. A picture posted to the Pacific Pines community group on Facebook by user Aynsley Laurie also highlighted the "snow-like" hail that blanketed parts of the Gold Coast. "So much hail it looks like snow". This picture was posted to the Pacific Pines community group on Facebook by user Aynsley Laurie. Bureau of Meteorology meteorologist Harry Clark said parts of the Gold Coast received heavy falls on Wednesday, including Norwell, which recorded 48mm and Pacific Pines, which got 28mm. He said storms were again likely on Thursday and this time they were expected to be further reaching. "Really anywhere in southeast Queensland this is the chance today for storm but it depends really on where they form," Mr Clark said. "Yesterday they formed in that Gold Coast hinterland and Scenic Rim region… but today there's a chance they could form right up to the Wide Bay region." Mr Clark said the storms could potentially become severe, bringing high winds, hail and possibly heavy rainfall. Similar conditions are also forecast for Friday and there is a chance storms will again develop on Saturday afternoon.